To fully appreciate this situation, some context is required: Kanin was what one might call an artist with intellectual aspirations, a skilled writer who worked in many different capacities in the film and theatre worlds from the 1930s onwards; Goldwyn, on the other hand, was a Big Producer, the “G” in MGM, a face of the money-driven side of Hollywood. This is their first meeting. Any encounter between two such personalities has funniness inherently built into it, and the mood is set by Kanin’s carefully respectful “Mr Samuel Goldwyn” and his throwaway use of “throne room”. 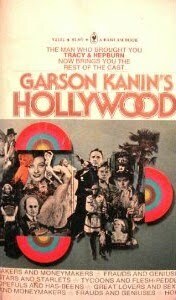 This is a running theme in Kanin’s Hollywood: creative people who hope to produce important and lasting work, being forced into the position of “doing business” with the men who pull the strings, and the many tentative relationships and great and mediocre films that emerged from these collaborations. This book isn’t a conventional history or study of the movie world. It’s unstructured, anecdotal, conversational – and just as affectionate as Kanin’s Tracy and Hepburn (which I wrote about here). In fact, Hollywood reminded me a great deal of David Niven’s Bring on the Empty Horses, another book that appears, on the surface, to be not much more than a compendium of gossip and funny stories about Hollywood celebrities, but which ends up providing some very sharp and incisive sketches – and arguably revealing more than a self-consciously academic work would. Chaplin began to eat, unhappily. I took another swig. “Look,” I said, “I’m not a believer and anything even suggesting the supernatural gives me a pain, but once in a while there’s something in circumstance or in fate that’s absolutely shattering, and this is one of those cases […] here is a time in the history of man when the greatest villain civilization has ever known and the greatest comedian civilization has ever known bear a physical resemblance to each other. Think of it. It’s, well, unbelievable, but we have to believe it because it’s there. I took a deep breath and continued in an awesome tone, “Who but God himself could be capable of such an idea?" Chaplin, a man not easily impressed, was impressed. 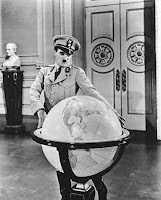 Drama is frequently based upon a triangular structure, and one consisting of Hitler, Chaplin and God was not bad. There was a long pause. We finished dinner. 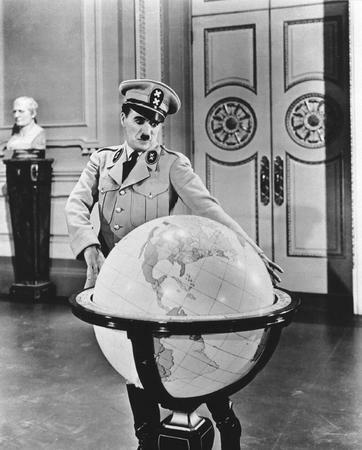 “You may be right,” said Chaplin. The following day, he called the picture off for good. The subject became taboo for several weeks. And that, ladies and gentlemen, is how some iconic movies start to get made. By the way, Samuel Goldwyn was the producer of arguably two of mainstream Hollywood's greatest films - William Wyler's Dodsworth and The Best Years of Our Lives. "I don't care if it (his new picture) doesn't make a nickel. I just want every man woman and child in America to see it." To my mind, that quote is so much more than an amusing line. It is a spirited defence of "commercial culture". It is an articulation of a belief that art and commerce need not necessarily be at odds with each other. Great Art with a broad popular appeal is more often than not, an unintended outcome of commercial considerations. Ofcourse it can be argued that Goldwyn has produced his fair share of mediocre films. But so do indie film producers! "With The Best Years of Our Lives I brought the boys home. And now - now I've got to send them away again!" Jai: I was looking for books related to cinema and cricket (cheap buys - used books will do). Here are some authors I'm looking for : Sarris, Farber, Robin Wood, Neville Cardus, Jack Fingleton, Ray Robinson among others. Shrikanth: I've never really spent any time exploring second-hand stores in Delhi (apart from the outdoor stalls one finds at the local PVR complex, and maybe a couple of trips to the Daryaganj Sunday market a long time ago). Some of the rare books I've bought (Robin Wood and Cardus among them) have been chance finds at various firsthand stores or the annual book fair at Pragati Maidan. But yes, I wouldn't mind locating books by Sarris or other not-so-accessible movie writers, so if you find out anything let me know! Sounds very interesting. Should check if Blossoms has another copy lying around somewhere! 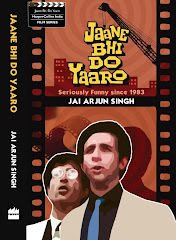 Jai, coming back to this blog after a long time, was delighted to read this review. I think you have captured the mood of this book perfectly , as much that the transition from the quotes to your review appears seamless.